As World Health Day approaches, and as we look towards the first-ever UN High-Level Meeting on Universal Health Coverage later this year, we’re sharing insights from BBC Media Action’s work to help health workers and communities work better together to build a healthier world. In low-income countries in Africa and Asia, many health systems are staffed by community health workers. 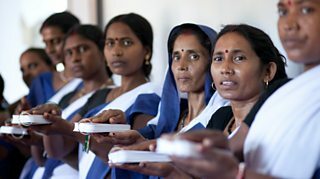 In Nepal they are known as Female Community Health Volunteers, in Ethiopia, Health Extension Workers, while in India and Bangladesh they are generally known as Frontline Health Workers. Whilst the names may differ, most are women, most work in remote areas, and many are volunteers. They play a vital role connecting people to, and sometimes providing, basic primary care; referring patients to clinical services and motivating families to adopt heathier practices. All are tasked with communicating about health, but often they lack sufficient training or engaging communication tools that would help them do this more effectively. In Nepal, access to communities can be extremely challenging for Female Community Health Volunteers (FCHVs) due to large distances and difficult terrain between communities and health centres in rural areas. What’s more, FCHVs are often balancing their responsibilities with looking after family and, as many of them are volunteers, trying to earn an income. Whilst access to mobile networks and internet is increasing, literacy rates remain low in rural areas and our research shows that some communities feel FCHVs should know more than they currently do. It became evident that updated training and tools that fit with the practicalities of FCHVs’ day-to-day lives and the changing community needs would help. Most FCHVs have access to a basic mobile phone and mobile network, so we’re now working with our partners to explore how training and tools for basic mobile phones will help them to carry out their duties in remote areas. We’re also developing creative printed materials to support their interaction with people of all literacy levels in their communities. In a similar project in Bangladesh, we discovered that health workers were using heavy, cumbersome flip charts to visit their clients in urban slums, so we developed a mobile app to help them undertake their roles more effectively. “Now I’m getting all the topics by using one app which is not possible with other tools (flash cards, flip charts, leaflets). 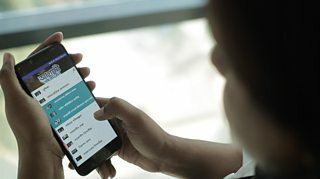 I can deliver all relevant information by the app which was difficult for me before” said one community health worker who frequently used the app. In rural India, the catalyst for the development of our highly successful Mobile Kunji and Mobile Academy projects was women’s lack of access to traditional mass media platforms. At the start of this work, our formative research showed that only a few women watched television or listened to the radio, however 82% had access to some form of basic mobile phone. So, rather than setting up a parallel system, BBC Media Action leveraged the one available. Using human centred design, our India team created content that worked on basic mobile phones and suited how health workers used them – to make and receive calls only. We created Mobile Academy, a training course for health workers, which is delivered through mobile audio messages, whilst Mobile Kunji is a set of visual cards and accompanying mobile audio messages that health workers can use during visits with families. Using these services and tools, our research has shown that health workers are able to better reach, engage, and influence families to improve their health. These projects have not only worked, but they’ve shown sustainability. By working in partnership with the state governments in Bihar, Odisha and Uttar Pradesh, we’ve trained 263,000 health workers so far on Mobile Kunji and about 260,000 people have completed the Mobile Academy course. Mobile Academy is now active in 13 states and we recently transitioned responsibility for the service to the Indian Government to continue its vital work long into the future. In Bangladesh we learnt that community health workers were struggling to communicate effectively about sexual health to young women and men, which limited the impact of their advice. So we developed a smartphone app. It shows Dr Natasha, a real doctor, talking about some of the key sexual, reproductive, and maternal and child health issues their clients were facing. By using appropriate language tailored to their audiences, we made sure the content was relatable, accessible, and engaging – which mattered especially in areas with low literacy levels. Our research showed us that health workers felt more trusted by their clients and were more successful in persuading them to adopt healthier practices, such as attending antenatal care visits. As one of the health workers described, “Most of my clients were not interested in listening to my suggestions before using the job aid. But now they are convinced as they see there is symmetry between Dr Natasha’s information and my own”. We found the app also helped to give them credibility to dispel myths around issues such as contraception and family planning. Community health workers cover a wide variety of health issues on their visits. Our research often reveals the benefits of refreshing or deepening their knowledge, but also of them gaining new skills on how to communicate within a family setting. We found in remote parts of Ethiopia, communicating with the men in the family is often overlooked because family health is still seen as a woman’s responsibility. So we ran training for Health Extension Workers which focused on how to create safer feeding and playing spaces for children under three, during which participants learned how to communicate effectively with, and actively involve, both women and men in the families. We found role play really helped during training because it encouraged Health Extension Workers to practise how to have compelling two-way conversations. Mistrust and suspicion between communities and health workers is common in many of the places we work. Through our research, we often hear about these difficulties and then aim to create safe spaces for communities and health workers to come together, get to know each other, and discuss often sensitive issues. In Nigeria we facilitate discussions around polio vaccinations and routine immunisation as part of our community drama radio recordings which are performed in front of a live audience. And, working with different partners, we accompany women during antenatal care check-ups to record what happens. By sharing real-life experiences in our radio programmes, it helps to build understanding and trust in health services amongst the public. 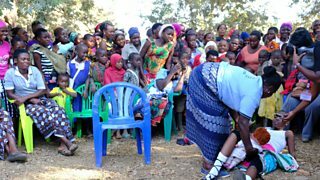 In Tanzania, we trained and worked with radio partners to facilitate lively community events that were recorded and broadcast in weekly radio shows to audiences across the country. The events were designed to build understanding about maternal and newborn health issues and encourage interaction with health workers. By facilitating conversations, we found people gained understanding and confidence to access health services. We also saw increased male engagement in maternal and newborn health care. In summary, we’ve learnt to not only help build the skills and confidence of community health workers, but also to help improve engagement between them and members of their communities. Through creative communication and human centred design, it is possible to create more effective tools fit for the difficult environments health workers operate in. And in doing so, we’re able to help health workers and communities work better together. Informed by our experience, BBC Media Action plans to continue this important work towards the UHC2030 global movement, to build stronger health systems for people around the world. The projects featured in this blog were carried out in conjunction with: national government ministries and departments of health, DFID, UNICEF, The Gates Foundation, UNFPA, Options, Abt Associates, Viamo, Care International, the Grameen Foundation and our media partners.